Place a pan over high heat. Pour the sugar into the pan and melt while whisking constantly. When it darkens, add the butter a little at a time, whisking vigorously to emulsify. Remove from the heat, then add the salt and whisk until fully dissolved. Add 1/3 of the apple juice and whisk until fully incorporated, repeat with the remaining 2/3 of apple juice. When all the juice is emulsified into the caramel, place back on heat and bring to the boil. Allow the caramel to cool completely before covering and reserving until ready to use. To cook the pineapple, remove the skin from the pineapple and slice a “trench” about 2 cm deep and 3cm wide, diagonally from top to bottom. 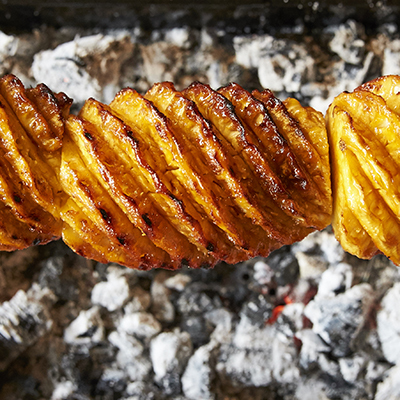 Place each pineapple on the roasting rod and fasten on either side of either the Hub or Fusion BBQ. Turn the rotisserie function on and roast for a couple of hours while brushing with the pineapple caramel regularly. In the meantime, pre-heat the oven to 170°C. Spread the pistachios on a baking tray and toast in the oven for 12 minutes. Place the sugar and 150g water into a small saucepan and bring to the boil over medium heat. When the temperature of the syrup reaches 135°C, or is beginning to colour at the edges, add the toasted pistachios and whisk until the syrup has completely crystallized and coated the nuts. Pour onto baking parchment and allow to cool. To make the caramel sauce, place the ingredients in a saucepan over a medium heat and bring to the boil. Whisk until the sauce reaches 120°C, then remove the pan from the heat. To finish, remove the pineapples from the spit and allow to cool slightly. Using a sundae glass, alternate ice cream and pieces of the roasted pineapples. Finished with whipped cream, crystallised pistachios and a drizzle of the caramel sauce.